A new report by Juniper forecasts that M2M (Machine to Machine) connections will be the catalyst for over $35 billion of service revenues across a diverse range of industry sectors by the end of 2016, driven by Automotive Telematics and Consumer Electronics. According to CISCO, the overall M2M connectivity market will grow from 58.29 million connections on a global basis in 2008 to 225.25 million connections in 2014, representing a CAGR of 25%. 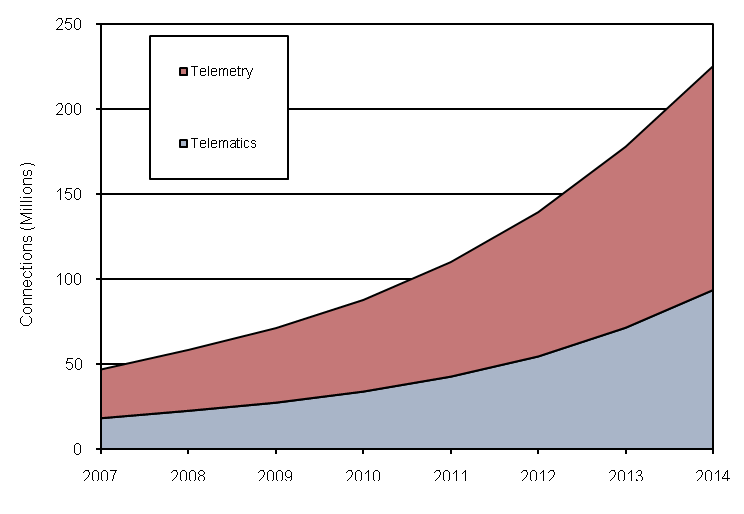 In 2008, general telemetry applications represented a majority of the market, with 35.81 million connections. General telematics applications combined represented 22.47 million connections. This relative mix would remain the same in 2014, with general telemetry applications retaining the majority share of the market with 131.73 million connections, and general telematics applications adding up to 93.53 million connections. Commercial automotive telematics driven by the requirement for fuel efficiency which engine management systems can deliver is the key growth engine. In-car entertainment systems and infotainment will support telematics growth in the consumer vehicle market. 1.Mobile network coverage is being expanded worldwide. 2.Telematics and telemetry are seen increasingly as sources of greater operational efficiency and increased incremental revenue. 3.M2M applications benefit from R&D and the scale of the mobile handset industry. 4.Technical advances in air interface standards are enabling new 3G M2M market segments. 5.Mobile network operators (MNOs) are seeking to expand their data service offerings.